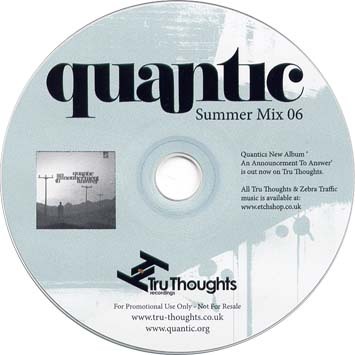 What's hot on the etchshop... For a limited period we will give you a copy of Quantic's Summer Mix CD when you buy any Quantic, Quantic Soul Orchestra or Limp Twins album from the shop. This mix isn't for sale anywhere so be sure to secure yourself a copy while we have them. anyone have a tracklisting for this mix cd. i really need to know a couple of tracks off of it.